This pulley calculator analyzes a system of two pulleys joined by a conveyor belt (also called a belt drive). You can use it to calculate the pulley RPM (revolutions per minute), but also its diameter, and some properties of the whole system (such as the pulley speed, belt tension or torque). You can use this tool right away or continue reading to learn more about the logic behind the pulley formulas. A pulley system consists of two pulleys (usually of different diameters) and a belt loop to link the pulleys. In the figure above, the belt is marked with a red color. One of the two pulleys is called the driver pulley - it means that transmitting power is applied to it, causing it to rotate. The other pulley is called the driven pulley. It rotates because of the force transmitted through the belt. You can use this formula to find any of these four values: driver pulley diameter d₁, it's angular velocity n₁, the driven pulley diameter d₂ or it's angular velocity n₂. where the angular frequency is expressed in RPM and the belt velocity in meters per second. You can also reverse this formula to calculate the distance between the pulleys for a known belt length. 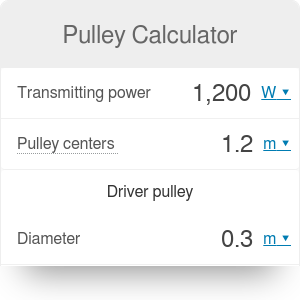 Naturally, you can use the pulley speed calculator to find the power as well - simply input the values of belt tension and velocity. where the angular velocity n₁ is expressed in revolutions per minute. Start with writing down the known values. Let's say that you know the diameter and RPM of the driver pulley (d₁ = 0.4 m and n₁ = 1000 RPM), the diameter of the driven pulley (d₂ = 0.1 m) and the transmitting power (P = 1500 W). You have also measured the distance between the pulley centers to be equal to D = 1 m.
Pulley Calculator can be embedded on your website to enrich the content you wrote and make it easier for your visitors to understand your message.